Monday mornings just before school your child comes and needs a new school book, or a coloured pencil. And you think “Why didn’t you tell me yesterday when I could have done something about it?” I know my kids would do this all the time. No matter how organised we were they would always remember something in the last minute. I have seen children have a melt down, saying that the paint needed was soo important and if they didn’t have it in art class they would be told off. How many of us would drive to the store and bring our child this much needed paint just before their art lesson? Your child’s teary meltdown would pull at your heart making it impossible to let it suffer. I know how that feels I have had this happen to me before when I have forgotten to order something that was on my list. I felt sooo bad that I went and dropped everything, drove to the shop because I just didn’t want to be the reason for this sadness. Or worse my child being told off in school. It was stressful and I was late for some meeting and I got all hot and sweaty. This feeling has reminded me never to be in this situation ever again. You go and grab your favourite pen. You get ready to write this super cool idea or just want to write in your victory log. You put pen to paper and start writing and nothing happens…..Your pens run out. Don’t you just get really upset when that happens? I know it sounds crazy but you just can’t write with any other pen. I really know how that feels!!! 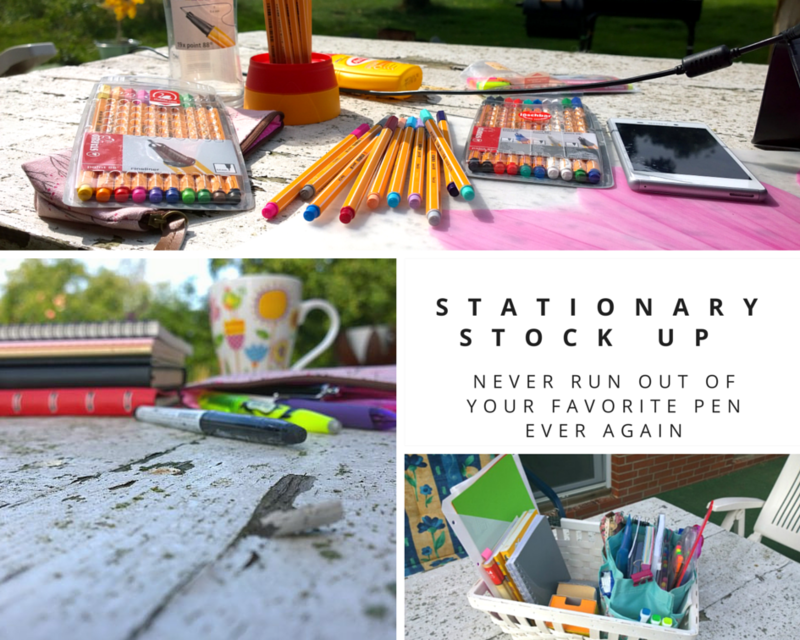 Stock up on school and office supplies. I recommend that you have a supply of school stationery at home. Kind of like your own school /office stationery shop. I used to have this for my kids and I still do have a box full of supplies for my English lessons, also things that my husband and I love to use in the office. The best time to stock up on school supplies is when they are on offer. Don’t wait till the end of school or beginning of the school year sale. Sometimes you can find really good offers when you are on the lookout. So, back then I had everything in a box enough for two children. Every time something was taken out of this box it was written down on a shopping list. My kids could take out whatever they needed for school but they were to tell me. We had everything from paper to pens to crayon and ink cartridges. Exercise books and most important the music exercise book (they are expensive and can’t be bought everywhere). Rulers and rubbers things that could get lost or broken. Plus a stock up of my favourite pens and post-it notes. I didn’t want to drive into town just for a pen that my child or I needed. I also wanted my children to be able to craft whenever they fancied. Plus I wanted to minimize all stressful conversations and situations with my children and myself. It drives me crazy, what I really mean drives me mental …. One summer holiday shopping tour, I get all excited because I’m going stationery shopping for myself, by myself!!! I need a sketchbook which I don’t seem to have at home. I plan in a whole morning and lunch time shopping. I have my water with me and money. I’m excited and believe that I will find everything that I need. I’m in this big art store and can you believe it ….can’t find what I need. They have no sketch books!!! I start to get reallyyy disappointed. Not forgetting that I have had to drive 30 minutes to get to this store. Then my phone rings, and I think I can let this disappointment out on my hubby (I know it’s not a nice thing to do, I was upset). BUUTT when the first and only thing he asks me is if I’m home and if I have closed all windows. My heart sinks, because I haven’t. I have left all windows open so that nice warm air is let into our at that moment very cold farm house. I forgot that it is harvest month and that our crops surrounding our house are going to be done right at that moment. So I had to stop my already disappointing shopping trip to drive home and close all windows. I got home in time, thank goodness, I have hay fever so this would have killed me. At home I was telling myself I could live with out the sketchbook and pens. That I should just use what I have. Lying to a stationery junkie doesn’t work that way. So I make up the next plan to drive to the other town where I believe they have all the stationery that I need. This takes me an other 15-20 minutes to get there, to find out that the whole town doesn’t have what I need. By this time withdraw symptoms have started to kick in. Not even the ice-cream that my husband has brought home with him as a “sorry that you had to come home early” helps. It just makes me feel sick, and my withdrawl symptoms turn into a whiny paralyzing state of Susan not being able to live with out a pen and paper. Horror for all who live with her. So hubby packs me up in my car and we drive another 45 minutes to shop number 4 of the day, which ends up being shop 5 where I find what I am looking for. I had wasted so much petrol on these pens and sketchbook, that I know this will not happen to me again for a very long time. I will not say ever again because let’s face it, I’m me and I know It will happen. Tell me do you buy your stationery in advance or are you someone who buys only what she needs when she needs it? Please remember, any comment you leave may help the next person. I usually keep some of that stuff on hand,but for me it’s those darn back boards for presentations.I too have ran to answer the cry of the teenager that has to have this backboard or the teacher will not accept the project. Just to drive the 30 mins back to town to find out that Staples is the only store not open.there goes an hour of my life and $10 in fuel I am never getting back.Not to mention the extra trip in Monday to buy it for like $10.So that’s like 30 so far spent on a stupid backboard.Just to see them a week later at the dollar store for $3.00. as you know I have been in your shoes, will not be running into town for stationary again. Your right in saying we will never get our time back so we should use it well. I keep things on hand, too-mostly, anyway! Office Depot recently offered spiral notebooks for one cent each (limit of 3) with a $5 purchase, so I got those. And little animal erasers-set of 3 for $1, so bought that for fun. Back-to-school time is great for bargains here, too. I always have a lot of pens, and yes, they do run dry. I keep buying pens, it seems, set of 12, set of 24. Latest special notebook is my emerald Leuchtturm1917 with the luscious creamy paper inside. Soo nice. 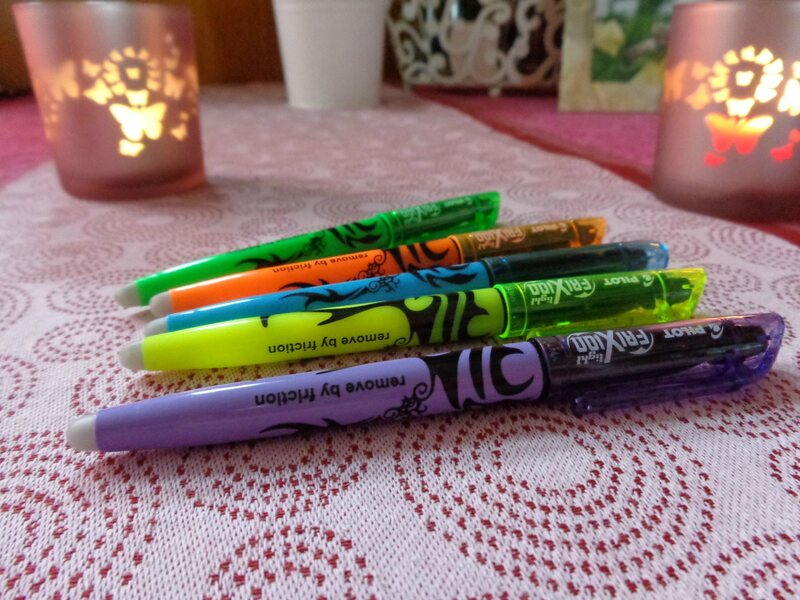 I recently did a post on my blog about 12 colored pencils-I remember when they were the only art supply I owned! Thanks, Susan, for a great post today!